This Egyptian Scarab Voodoo Paranormal Skull Statue is 6.25" tall, 8.5" long and 5.5" wide approximately. This Egyptian Scarab Voodoo Paranormal Skull Statue is made of designer composite resin, hand painted and polished individually. This Egyptian Scarab Voodoo Paranormal Skull Statue is 6.25" tall, 8.5" long and 5.5" wide approximately. This Egyptian Scarab Voodoo Paranormal Skull Statue is made of designer composite resin, hand painted and polished individually. 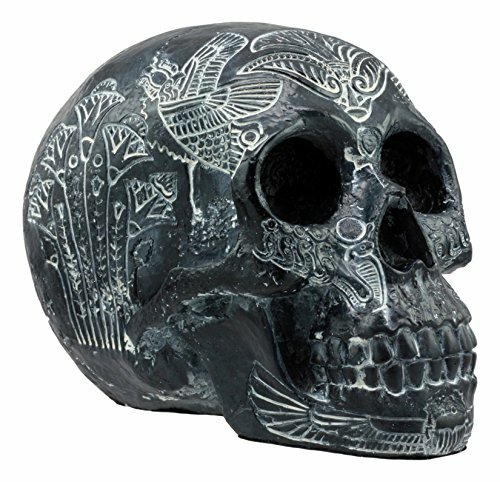 Etched with the Egyptian symbols of Gods and Deities, this replica skull has been hand painted for a gothic black finish. The main character of this skull is the Scarab Dung Beetle, a symbol of rejuvenation and rebirth. Other significant symbols include the horus falcon and the lotus fans.